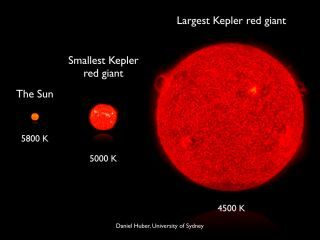 Sizes of red giant stars compared to the Sun. Using the Kepler telescope, we have detected oscillations in hundreds of red giant stars. The periods of those oscillations allowed us to study the interiors of these giant stars, which represent the future life of our Sun. Astronomers have taken the pulse of red giant stars by measuring their starquakes — stellar shivers that run so deep they can reach a star's core, scientists say. These new findings can help scientists separate the vastly different types of red giants that would otherwise look virtually identical, which could help shed light on the future of our sun and the history of the galaxy. Red giants are the swollen fate that awaits stars such as our own sun as they begin to exhaust their primary source of fuel, the hydrogen near their cores. The byproduct of the nuclear fusion that powers the sun — helium — accumulates over time, forcing hydrogen into a shell around the core that burns more vigorously than before. Stages in the evolution of a star like the sun. The sun is currently fusing hydrogen into helium in its core (lower left). In later stages, when it becomes a red giant, the star will fuse hydrogen in a shell around the helium core (2nd and 3rd figures). Finally, the red giant will begin to fuse helium into carbon in its core (4th figure). After red giants age, they should, in principle, start burning the helium in their cores as well. However, although theoretical calculations predicted that this profound transformation should occur, scientists had never actually witnessed it, since the change would be largely invisible from the outside. Now, by analyzing "starquakes," researchers have uncovered secret differences lurking in the hearts of these red giants. "In the same way that geologists use earthquakes to explore Earth's interior, we use starquakes to explore the internal structure of stars," said researcher Timothy Bedding, an astronomer at the University of Sydney in Australia. Using the Kepler spacecraft, researchers observed about 400 red giants over the course of nearly a year. They discovered that hydrogen-burning stars demonstrated a range of sequences of a kind of gravity-linked vibration that differed from each other in the time they took to complete by up to 50 seconds, while helium-burning ones showed differences of about 100 to 300 seconds. The cores of these latter stars are much hotter and less dense, Bedding explained, meaning that sound travels more slowly through them. "We were hoping to see a difference in their oscillation properties, but I did not expect it to be so clear-cut," Bedding told SPACE.com. Now the researchers will scan red giants en masse to see what stages of evolution they have reached, "trying to work out details of the history of the Milky Way," Bedding said. The scientists detailed their findings in the March 31 issue of the journal Nature.